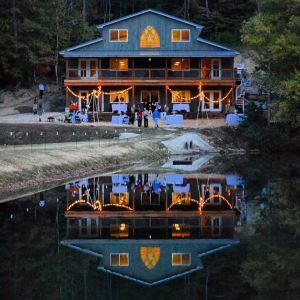 Pigeon Mountain Crossing is a stunning location for a wedding, celebration or social event. We are a Christian Camp and Retreat Center, right outside of Chattanooga, TN. The property is 80 acres of woodlands and a 12 acres spring-fed lake, nestled at the bottom of the Pigeon Mountain, GA Wildlife Preserve. Our venue can facilitate both indoor and outdoor weddings. "The Barn" is approximately 6500 square feet of space with rustic yet elegant charm and the comfort of modern amenities. There are large porches on both levels that overlooking the sparkling water and gorgeous mountain view. Please visit us at Pigeon Mountain Crossing to plan your perfect day. A wedding on a weekday of Monday through Thursday is available at a special rate of $1000 plus tax. This includes use of our lodge, an outdoor location, 200 white chairs, tables, pews, lights, some decorations, 2 rooms in our cabin for getting ready and we direct the parking. You can add lodging the night before or of for up to 30 guests for an additional $750 a night. All prices subject to a 10% sales tax and a $200 cleaning fee. A Friday or Sunday wedding is $1900 plus tax. This includes use of our lodge, an outdoor location, 200 white chairs, tables, pews, lights, some decorations, 2 rooms in our cabin for getting ready and we direct the parking. You can add lodging the night before or of for up to 30 guests for an additional $750 a night. All prices subject to a 10% sales tax and a $200 cleaning fee. Saturday (9am to midnight) wedding is $2400 plus tax. This includes use of our lodge, an outdoor location, 200 white chairs, tables, pews, lights, some decorations, 2 rooms in our cabin for getting ready and we direct the parking. You can add lodging the night before or of for up to 30 guests for an additional $750 a night. All prices subject to a 10% sales tax and a $200 cleaning fee. A Friday and Saturday wedding is $3200 plus tax. This includes use of our lodge, an outdoor location, 200 white chairs, tables, pews, lights, some decorations, one nights lodging for up to 30 guests in our cabin, and we direct the parking. All prices subject to a 10% sales tax and a $200 cleaning fee. A Friday, Saturday, Sunday wedding is $3600 plus tax. This includes use of our lodge, an outdoor location, 200 white chairs, tables, pews, lights, some decorations, two nights lodging for up to 30 guests in our cabin, and we direct the parking. All prices subject to a 10% sales tax and a $200 cleaning fee.